So today Darren and I took a trip to Cambridge just for a day out and some shopping. We intended to do some Christmas shopping but ended up just buying for ourselves (and lovely Darren treated me to a couple of things because he's a babe) - oops!! It was such a lovely day though, Cambridge is such a gorgeous city, there's so much to do and a lot to see. It's nice to get away from the same old day to day sometimes! I thought I'd share a few photos of the day in a quick post today as I've got today's haul and some reviews coming up in the next few days. I absolutely love the weather at the moment, it is cold but I do adore autumn/ winter time. Everything looks so pretty when there's orange leaves and low sun don't you think? Aw you guys are so cute. Too cute :) I love the beanie with the skirt! That skirt is lovely on you! 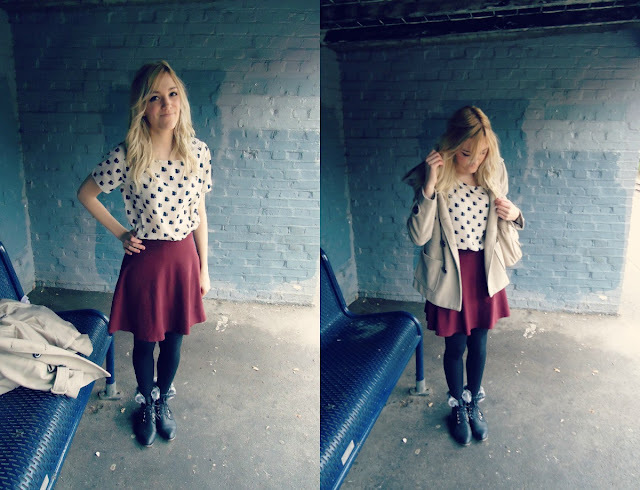 Such a pretty Autumn outfit. And I actually really like your boyfriends jumper too! lol. you both look adorable! looks like you had a nice day! :) love the outfit! yes, fall/winter is my favourite time of year! Adorable photos and outfits. I'm so jealous of the oreo dairy milk, I need to hunt it down! You two are so adorable! Love your outfit, especially the burgundy hat!